While the Iron Man suit; for the most part, defies physics (not to mention minimal development costs that start at a quarter-of-a-million dollars), some of the technology of the Iron Man suit can be achieved or will be in the near-future. 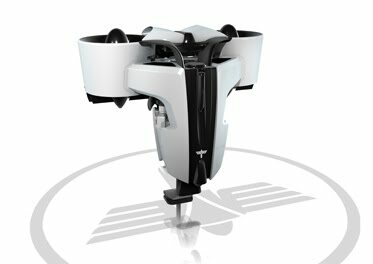 The Martin Aircraft Company in Christchurch, New Zealand have been trying to perfect the jet pack for over a decade. They are going to debut this year for about $150,000 per unit. It is the first commercial jet pack. While it cannot go into the air higher than 3.3 feet or go faster than 6.2 miles per hour, it is still progress in the development of jet packs. While we still do not have a ‘decent’ jet pack that will have us flying around like Iron Man or the Rocketeer, there are a few that we can look at or even buy. Two more jet packs are coming from Tecnologia Aeroespacial Mexicana and Jetpack International, both jet packs will each give you only about 30 seconds of flight time, with Jetpack International’s model boasting a slight advantage in speed, topping out at 70 mph. 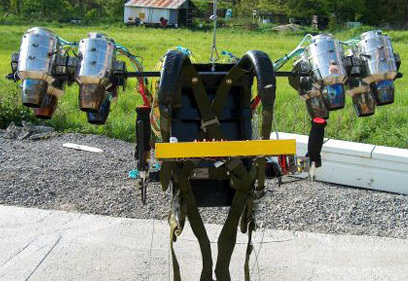 For $250,000 and $155,000 you can get these jet packs individually and the flight training necessary. Jetpack International is reportedly working on a new model that will give the user a full 19 minutes of flight time. Rick Herron, the creator of Skywalker Jets, has designed a rocket pack that weighs 90 pounds and can propel a 200-pound pilot in the air for 5 minutes. Rick has plans to eventually produce a final model that will have a range of about 4 miles and includes a integrated GPS unit into the HUD showing the flight time and engine information as well as other details to assist the pilot during flight. Rick plans to get the device approved by the FAA and available to the public for $200,000, if it goes into production. In the film Iron Man, the repulsors at the bottom of Iron Man’s boots and in his palms are used to propel him through the air. They are powered by the Arc Reactor. In real-life, jet packs work by shooting jets of escaping gases or water downward. The usually use nitrogen, hydrogen peroxide, or kerosene, while some use Turbojet engines. Currently, most electronic portable power sources in real-life cannot produce enough power to lift a person, much-less, a heavy suit of armor off of the ground. This is why gases are mostly used in jet packs for this purpose. To build an Iron Man suit, the builder would have to create or find a way to power the suit, and create enough thrust and propulsion to get himself and the suit off the ground. Currently, the only option for getting a person off of the ground (like in the film) is with jet packs which (at this point in time) use gases. The builder can not use gases in an Iron Man suit because of the limited flight time (barely seconds) due to the small amount of gas the suit can carry with it, and the rapid burning up of the gas inside of it to be of much use to the builder, which leaves the builder with one choice. Electrical power. The power that such a suit would need has not been developed yet due to the lack of massive amounts of energy (without using a large cable attached to it, which limits the suit’s range of flight) that can be transported through flight, which limits the abilities of a real-life Iron Man suit. The ‘repulsor technology’ is the technology that Tony Stark uses in the Jericho Missile and in the Iron Man suits. The repulsor technology is basically thrust (it means: to repulse, to expel, etc.) The gloves are ‘flight stabilizers’ which help him to stabilize himself when he uses the Iron Man suit. The repulsor thrusters are also incorporated into the gloves to assist with flight. The boots are used to lift himself and the suit off the ground while using the gloves to hold himself upright. According to the US Government, real jetpacks have very little practical value due to the limitations of current technology. The United States armed forces, which has conducted most of the jet pack research, has declared that helicopters are far more practical due to the ability to quickly transport more supplies and troops. Many others have worked on devising a functional jet pack, but with limited success. Personal jet apparatuses used in the military would be primarily used for use in reconnaissance, crossing rivers, amphibious landing, access to steep mountain slopes, overcoming minefields, tactical maneuverer, etc. One of the largest stumbling blocks that would-be rocket pack builders face is the difficulty of obtaining concentrated hydrogen peroxide, which is no longer produced by many chemical companies. The few companies that still produce high-concentration hydrogen peroxide only sell to large corporations or to governments, forcing amateurs and professionals to make their own hydrogen peroxide distillation installations. To understand jet packs (in real-life) you have to have an idea of how they work and how they are propelled into the air. In hydrogen peroxide powered rocket packs, a hydrogen peroxide-powered motor is based on the decomposition reaction of hydrogen peroxide. Nearly pure hydrogen peroxide is used. Turbojet packs are packs with the turbojet engine that work on the traditional kerosene. They have higher efficiency, greater height, and a duration of flight of many minutes, but they are far more complex in construction and very expensive. Only one working model of this pack was made; it only underwent flight tests in the 1960s and at present, it no longer flies. Rocket packs are used for extra-vehicular activity (EVA) in outer space. While near Earth, a jet pack has to produce a g-force of at least 1g. With only small amounts of thrust needed, safety, and temperature are much more manageable than in Earth gravity inside the atmosphere. Winged jet and rocket packs are jet packs that have wings that assist them with gliding through the air. A water-propelled jet pack is a recently conceived concept that has a small unmanned boat with a pump that delivers pressurized water to the jet pack via a hose, so it can only be used over a body of water.